Asbestosis, while not a cancerous condition, is serious and potentially life-threatening chronic disease that is caused by breathing in asbestos fibers. A person who has been diagnosed with asbestosis has a much higher chance of developing lung cancer or pleural mesothelioma, a fatal cancer affecting the lining of the lungs. While not all asbestosis cases will progress to cancer, asbestosis can be a strong indicator that asbestos exposure was a factor in the development of a malignancy. Similar to mesothelioma, in asbestosis, asbestos fibers make their way to the lungs and become embedded in the inner tissue. The tissue then scars causing fibrosis. Once the tissue begins to scar, it then starts to harden which stops the flow of oxygen; making it hard for the victim to breathe. It can take between 10 and 40 years to develop asbestosis. Signs and symptoms of asbestosis are very similar to that of mesothelioma, with one of the most common symptoms being shortness of breath. Breathing gradually becomes worse over time as the scarred tissue in the lungs begins to harden. Other signs and symptoms include: a persistent dry cough; tightness in chest or chest pain; weight loss and loss of appetite; crackling sound in the lung when breathing in. One of the more unusual symptoms of asbestosis is called finger clubbing, in which fingers and toes become wider and rounder. It is not entirely certain what causes finger clubbing, but researchers believe that when certain components in the blood become activated, it interferes with the nail bed. The tissue under the nail plate becomes thicker causing the nail to widen. Maintaining oxygen levels in the blood can help to prevent clubbing. 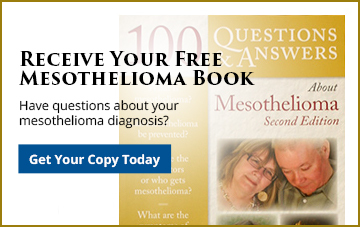 How will I know if my asbestosis will lead to lung cancer or mesothelioma? Those suffering from asbestosis can live many years with the disease, even though the disease progressively gets worse over time. When diagnosing both mesothelioma and asbestosis, the first step is an X-ray or CT scan. The amount of whiteness showed in the X-ray determines the stage of the disease and may prompt the doctor to then perform a biopsy to look for cancerous cells. Smoking is a contributing factor. Those who are suffering from asbestosis and still smoke can increase their chances of developing lung cancer or mesothelioma because of the constant progression of the disease. If you have been diagnosed with asbestosis, it is important you speak to an attorney to understand your rights and pin-point the location where you were exposed to asbestos. For decades, companies knew about the dangers of asbestos exposure and many downplayed and ignored the issue. Many workers were at risk of being exposed without even being aware they were handling asbestos-containing products. The asbestos attorneys at Goldberg, Persky & White, P.C., have represented thousands of mesothelioma, lung cancer, and asbestos disease victims and over the last 30 years. We have grown into the largest law firm in Pennsylvania representing injured workers, specifically those injured by asbestos. Contact us today for a free case review.